1.by all accounts its the dogs doodahs on anything Honda including rematching ecu after flat battery, and as it includes all the green units F100 to F109 it seems to have a lot of token free coverage including it claims Toyota G and H reset, if just 70% of the claimed coverage works then its a lot of programmer for the money and paid for and in profit after half a dozen jobs. 1.I’ve only had Xtool EZ500 full diagnostic system for a few days, and will update my review as I get more familiar with mine, but so far I’m very impressed. 2.I can confirm it will read PIN code & program keys for a 2008 Jeep Wrangler, and appears to be accessing all other modules on that vehicle. 3.I also connected it to a 2001 Ford Sport Trac and it seemed to access all functions well.Also, on both of these vehicles it appeared to work fast. 4.I test it and it can record and playback live data. 5.It is really good and when it can diagnosis reports in PDF file. 6.The unit appears to be built very well and has a solid, professional feel to it. Activating / registering it online was simple and only took a few minutes. 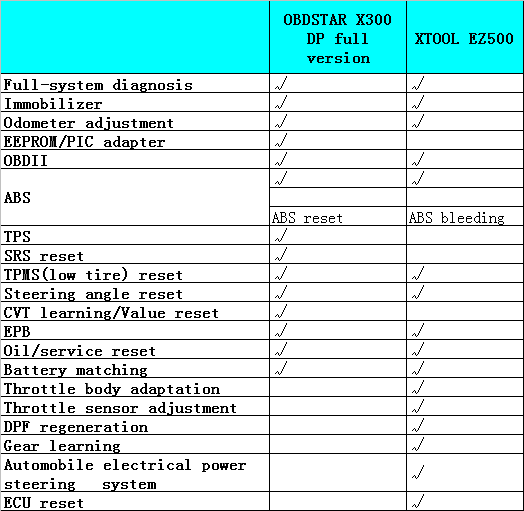 In conclusion, both Obdstar x300 dp and Xtool ez500 from OBD2TOOL have their own merits and demerits. Both are good at OBDII diagnostic and special functions for cars (heavy duty truck), though it’s kind of different in details, e.g. 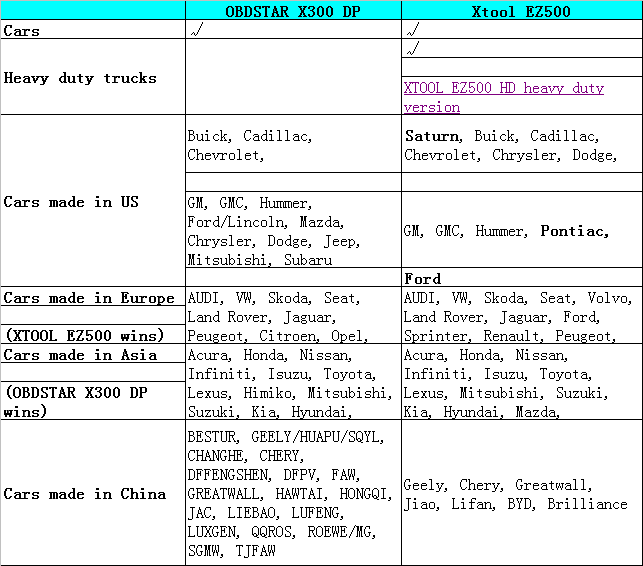 there are some special functions for some models that Obdstar supports while Xtool cannot support and vice visa. Besides, Obdstar key master dp wins in hardware design. 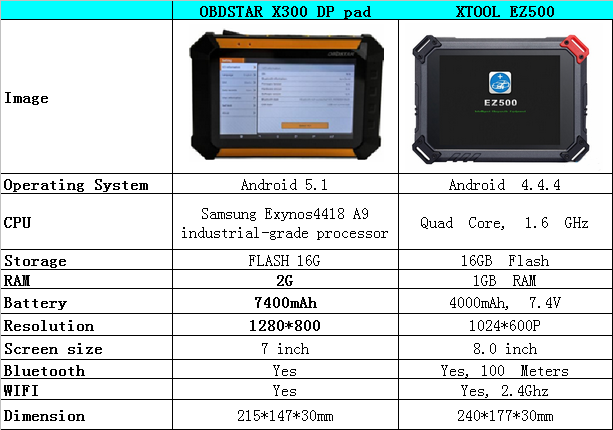 Upgrade news on Obd2tool.com ,Original OBDSTAR X300 PRO3 (Key Master), OBDSTAR X300 DP (Key Master DP) and OBDSTAR X300M full configuration updated odometer reset etc car models, new immo, PDF reset, the new released adds fuel injector function on May 27th,2017.